Lightly grease an ovenproof platter and set aside. Beat eggs in a medium-size bowl; stir in cottage cheese, flour, sugar, garlic and seasonings and mix until just blended but still lumpy. Gently stir in melted butter until combined. Pour batter by tablespoonsful into a skillet to form 2- to 3-inch pancakes. Cook until edges are light golden brown and bubbles form on the top (about 2 minutes). Turn pancakes over and cook until the bottoms are light golden brown. Pancakes should be crispy on the outside and creamy inside. Place cooked pancakes on the platter in a 200°F oven to keep warm while you cook remaining batter. 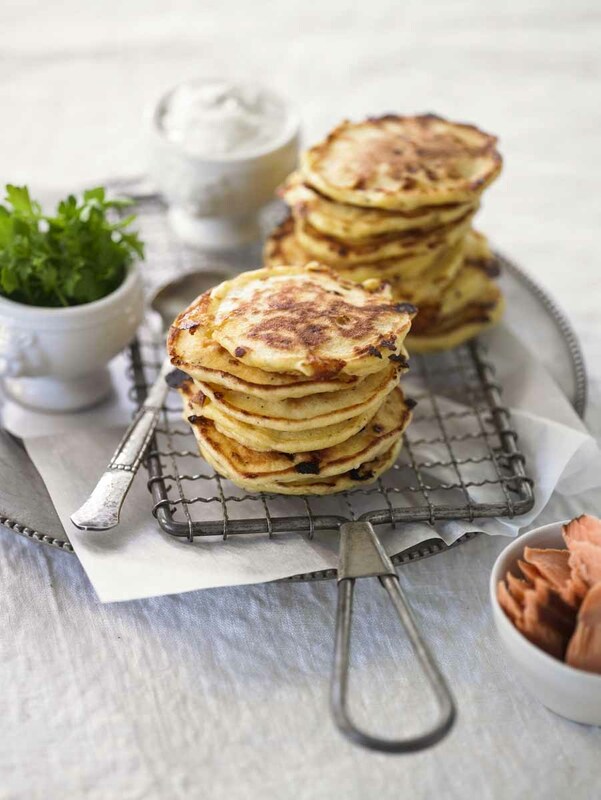 To serve, place a dollop (1 teaspoon) of Basil Sour Cream on each pancake; garnish with sun-dried tomato strips. BASIL SOUR CREAM: Combine 1-1/2 cups Darigold sour cream and 1 teaspoon crushed dried basil in a small mixing bowl until well blended; refrigerate until ready to use. Makes about 1-1/2 cups. Makes 25 to 30 approximately 2 1/2-inch pancakes.